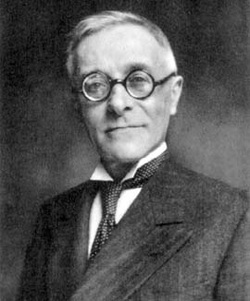 Tullio Levi-Civita was an Italian mathematician, known for his work on absolute differential calculus, which we also call tensor calculus. He has worked with Gregorio Ricci-Curbastro with whom he invented the absolute differential calculus, and had correspondence with Einstein, at the time. He has also done work in other domains such as analytic mechanics and hydrodynamics. Since classical vectors where proper to domains such as physics and mechanics, mathematicians discovered that in certain physics’ areas, variables could not be transposed into one-column vector. That is the case for variables coming from continue mechanics, fluid or solid, electromagnetism and relativity. At the end of the nineteenth century, after the analysis of certain forces leading to a nine number vector character rizing forces or voltage, mathematicians had to invent a new geometric object. Therefore, tensors were created. Tensors have, as an advantage, to be able to be free of coordinate systems, which make the development invariant. It is useful in relativity since it reduces calculations.